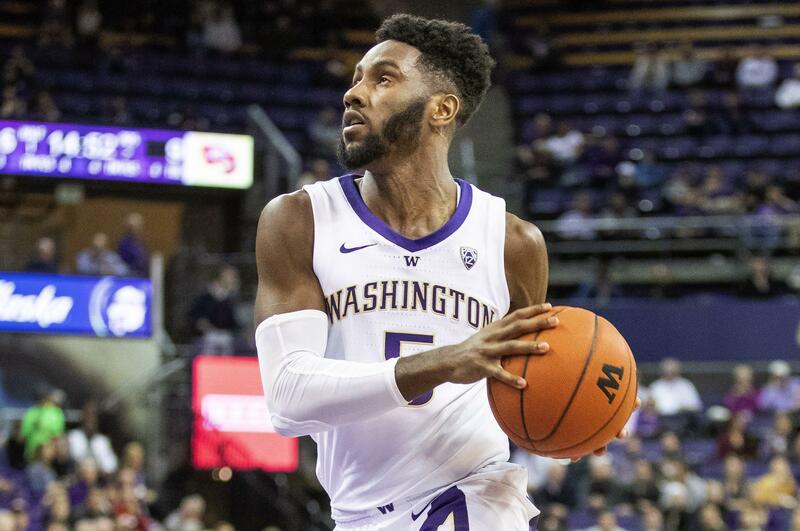 SEATTLE – Even though the Huskies led almost the entire game, Washington just couldn’t put UC Santa Barbara away. Until Jaylen Nowell took things into his own hands in the final minutes. Nowell had 17 points, including a tie-breaking jumper with 1:13 left that gave the Huskies the lead for good as Washington came away with a 67-63 win over the Gauchos on Sunday night. “An ugly win is better than a good-looking loss,” UW coach Mike Hopkins said. UCSB trailed most of the game, but UW couldn’t put the game away until the final minute. After Jay Nagle missed 1 of 2 free throws that would have given the Gauchos a lead with 1:35 left, Nowell hit his fadeaway jumper to give UW a 62-60 lead. Nowell hit a pair of free throws on UW’s next possession to extend the lead to four points, too many for UCSB to overcome. Noah Dickerson led the Huskies with 22 points and eight rebounds. Dickerson was back in the starting lineup after being limited to seven points in 11 minutes with an illness in the Huskies’ last game against Eastern Washington. That was the only time in the last four games he failed to score at least 20 points. Matisse Thybulle had 13 points and six steals, both season highs, but fouled out with 4:14 left. Ar’Mond Davis led UCSB with 20 points and 10 rebounds, and Devearl Ramsey scored 12. UCSB took its first lead at 37-36 with about 12 minutes to play. Amadou Sow’s free throw capped a 12-2 run for the Gauchos that also featured back-to-back 3-pointers by Ramsey and Jay Nagle. Thybulle answered with a pair of 3-pointers. Thybulle also had a big 3 after the Gauchos next took a lead with 7 1/2 minutes left, the last time UCSB led. Washington started strong, taking a 10-0 lead in the opening three minutes. Things quickly cooled, as both teams had trouble scoring most of the first half. The Huskies led 26-21 at halftime, and then in the second half the Gauchos kept the pressure on. USCB: The Gauchos entered the game on a five-game win streak, but hadn’t played a power-conference team yet this season. UCSB was hurt by poor free-throw shooting, going 11 of 21 from the line. Published: Dec. 2, 2018, 9:17 p.m.